It's that time of year again when we look for the perfect Holiday dress! It's my favorite part of the season when it comes to fashion (aside from the Victoria Secret Fashion show, obvi). Christmas party dresses come in the most fun styles! This is the time to step out of the box and play with new textures, silhouettes, and colors. 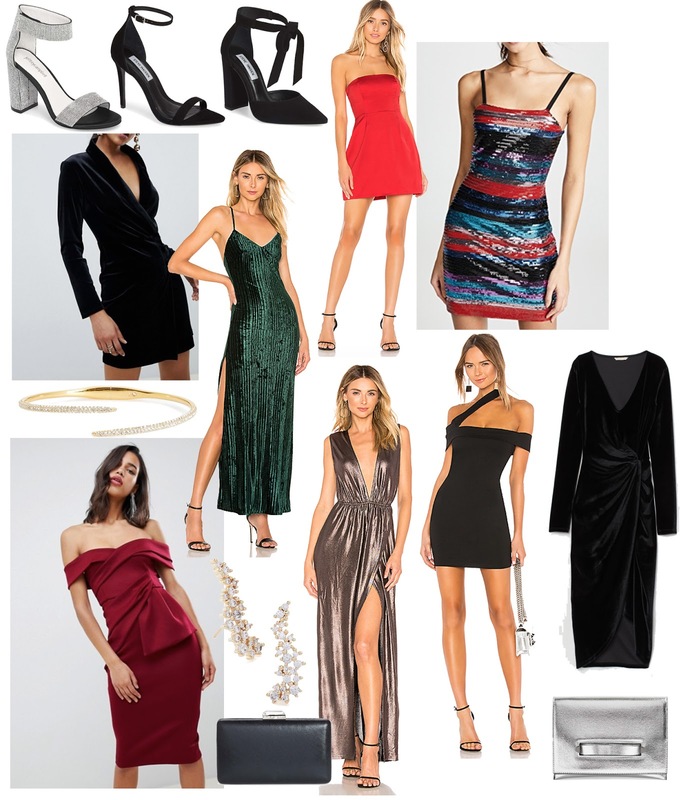 I've rounded up a few of 2018's best holiday party dresses in categories below - in ALL price points. I'm personally willing to splurge a little when it comes to the right holiday dress, but I rounded up some awesome budget-friendly pieces too. If you're on a tight budget, but need a cute new Christmas party dress, H&M has the cutest pieces here. LBD - You can never go wrong with a classic little black dress. It's an effortless style that will forever be a hit. There's also endless ways to restyle a plain LBD, by switching out heels and accessories, to give it a fresh look each time. Gowns - A floor length gown is a serious show stopper. If you have any formal parties to attend, you can't go wrong with these options. Red Dresses - Nothing says holiday like a red dress at your Christmas party. Green Dresses - I am BEYOND obsessed with green holiday dresses right now. Our annual Christmas party is a black and white dress party, or I'd be snatching one of these up in a heartbeat. Metallic Numbers - If there is any time to bust out the metallic styles, it's for the holidays. Wear it to a Christmas party, then restyle it for New Years. Sequins - Similar to the metallic dress, just slightly more extra - sequins are your best friend this time of year. Velvet - Wrap me up in velvet and I'll be good to go. This plush fabric is one of my favorite trends, and is not going anywhere anytime soon. Accessories - Add a little glam to an otherwise basic chic with these fun holiday accessories. Absolutely love these dear, gorgeous dresses you got there!